Well its not worth a whole venti morning cup but I thought I'd let you know that its SNOWING here! 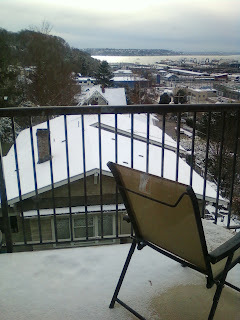 Its probably snowed over an inch and Queen Anne is blanketed in white! Its beautiful! And it didn't seem to bother Roy when we took him outside--I think he likes it! We know we do (at least until we have to drive)! Roy came home this morning and has been hopping all over--I actually had to leash him to the couch so he wouldn't follow me around so much! In between following me around and devouring his rawhide bone, he's been taking good long naps which is really good! He's moving his foot forward when he walks and it twitches when he has doggie dreams and he was using it to stabilize his bone--showing he probably doesn't have nerve damage! He's doing great thus far and since he's my Christmas puppy he appropriately situates himself beneath the tree. That's all our news for now--thank you all for your prayers again for our Roy Boy! Enjoy this CHRISTmas season!